General information: If there was ever a reminder of what drinking in Victorian days was like, you’ll find it at The Bodega. 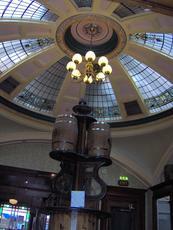 One of the most popular venues in Newcastle, and the pub where staff from other pubs go for a drink, it boasts a traditional long bar, Victorian stained glass domes, elaborately tiled floors, and lots and lots (and lots) of history. As CAMRA Newcastle & Northumberland 2005 Real Ale Pub of the Year, you can also expect a true commitment to offering the very best real ale. And when you combine that with simple lunchtime snacks, a great mix of people, large screen plasma TVs, and friendly staff, it’s the perfect place to relax before or after visiting nearby St James’ Park, the Journal & Chronicle Theatre, or virtually anywhere else. The Bodega was supposed to be our last pub of the day before the train home yesterday. But, with the train cancelled, we also managed to fit the Newcastle Tap in (not listed on here). The Bodega is always popular immediately after a football match and yesterday was no exception. Ales were Fyne Ales Jarl & Blunder, Big Lamp Prince Bishop, Almasty Creation & Citra IPA, Brass Castle Bad Kitty & Cliffhanger & Bristol Beer Factory Beam Me Up. Although it was almost impossible to select a beer on first arrival, due to the crowds around the bar. Luckily, it started to thin out a little and my choice (the Bad Kitty) was confirmed to be correct, as I'm always a fan of darker beers. Six Nations ruby was on the TVs. Still a decent boozer. But, I couldn't see any real cider on this visit. Lovely pub to look at, and a nice pint of Almasty(? 3.20), a beer not seen before or since. The ambience was dented somewhat by a group of braying dolts talking over each other as loud as possible, making conversation for the rest of us impossible. Still, that would be a temporary fault & the pub is otherwise marvellous. Relaxed, welcoming and comfortable pub, with wide range of real ale from independent brewers. Friendly and efficient service. A 'must visit' when in Newcastle. 10/10. Great staff, good beer, interesting location. More local beers needed but good. Well worth a visit.